On the Toei Oedo Line, go to theTsukiji Market Station. Take exit 2A. 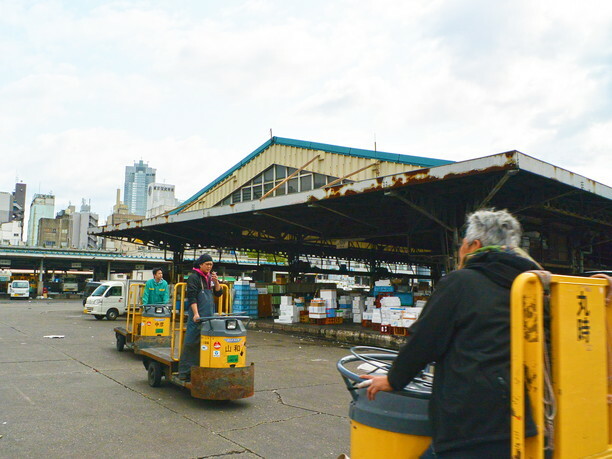 It is a 2-minute walk to the Tokyo Metropolitan Central wholesale Market (commonly known as the Tsukiji market)(築地場内市場). 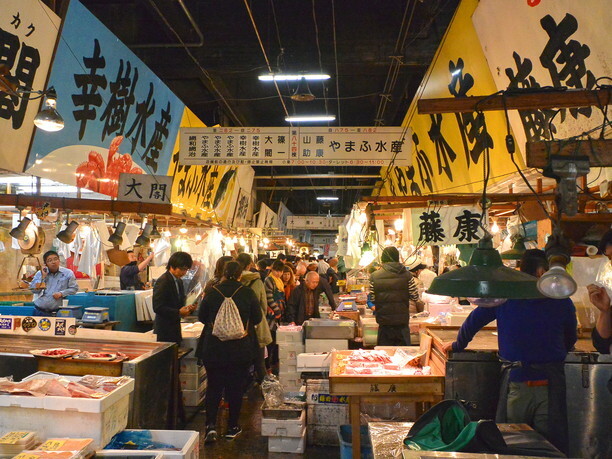 Here fish and vegetables from across the country and overseas are brought to be sold. It is sometimes referred to as “Tokyo’s kitchen.” Goods start being sold by auction at 5:00 a.m.. Bidding can only be done by professionals who come representing wholesale commercial stores. At 7:00 the market is opened to all commercial shops, and then at 9:00 it is open to the general public. 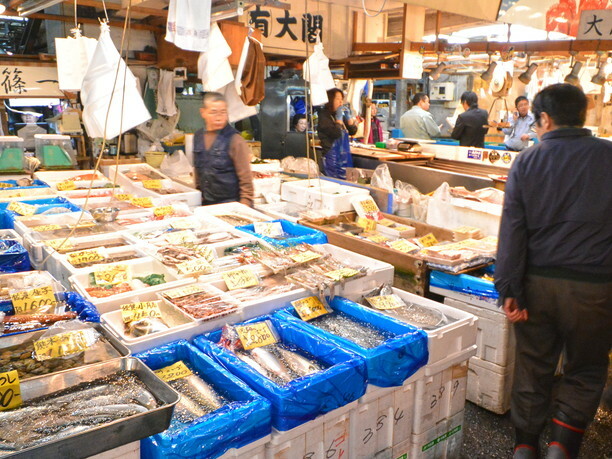 The area around the market is known as “fish shop alley.” It is more tourist oriented. There are more than 149 restaurants and shops where you can and enjoy a fresh breakfast or lunch. This seafood is worth it, even if you have to wait in line! Enjoy a tour of the tuna wholesale lots and auction. The market offers a popular tour of the tuna wholesale lots and auction house. Advance registration is not required! Registration starts at 5:00a.m. at the Osakana Fukyu Center. The tour only allows 120 people, so it is likely that a line will start at about 4:00a.m.. The tour lasts for approximately 25 minutes. You will get a chance to see all the fish that will be sold and witness firsthand the exciting auction process. Incidentally, flash photography and the wearing of high-heeled shoes is prohibited in the auction house. Have fun buying cookware and other souvenirs! There are lots of things other than just fish to buy as souvenirs at the market. Cooking utensils and other kitchen hardware used by professionals are popular souvenir items. There is also dry processed foods and condiments for professional use. That means that a lot of restaurants shop here. 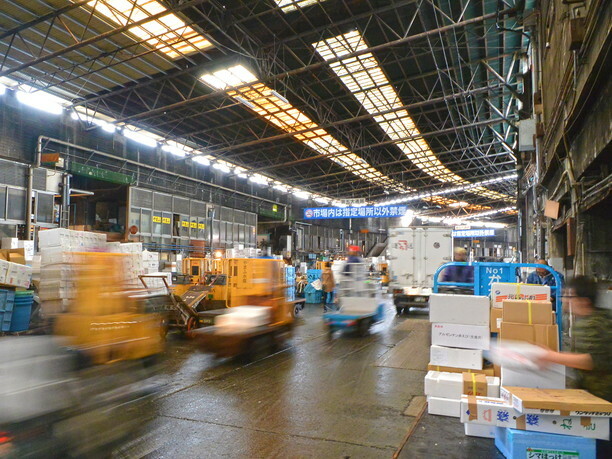 The Tokyo Metropolitan Central wholesale market (Tsukiji market) closes at 1 p.m., so make your shopping plans accordingly! ・From Toei Subway Oedo Line, Tsukiji Shijo station it is about a 5-minute walk. By taxi it is approximately a 10-minute ride and costs 660 to 730 yen. ・From the Tokyo Metro Hibiya line, Tsukiji station it is about a 15-minute walk. By taxi it is approximately a 10-minute ride and costs 660 to 730. ・From the Toei Asakusa line, Higashi Ginza station it is approximately a 15-minute walk. By taxi it is approximately a 10-minute ride and costs 660 to 730 yen. ・From JR Shimbashi station it is approximately a 15- minute walk. By taxi it is approximately a 10-minute ride and costs 740 to 820 yen. 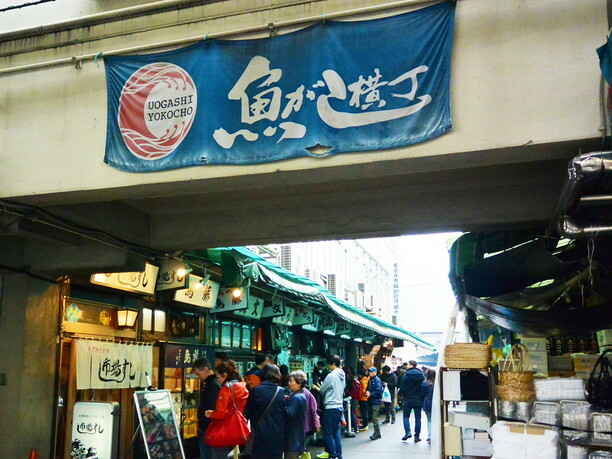 Tsukiji market is highly recommended spot for lunch in the gourmet city of Tokyo!